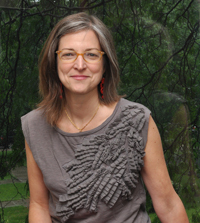 Rebecca Garden, PhD, is Associate Professor of Bioethics and Humanities and holds a joint appointment in Public Health and Preventative Medicine at Upstate Medical University. She earned her doctorate in English and comparative literature from Columbia University. Before coming to Upstate in 2004, she was Associate Director of the Program in Narrative Medicine at Columbia University's College of Physicians and Surgeons. Dr. Garden's research draws on fiction, autobiography, film, and video, as well as critical approaches to disability, deafness, gender, sexuality, and race/ethnicity, to examine socio-cultural and ethical issues related to illness, embodiment, health, and health care. Her current research explores literary and critical paradigms that can move understandings of dementia, quality of life, and personhood beyond reason. She has published in journals such as New Literary History, Disability Studies Quarterly, the Journal of Medical Humanities, the Journal of Clinical Ethics, Academic Medicine, and the Journal of General Internal Medicine. Dr. Garden is Executive Director of the Consortium for Culture and Medicine, an inter-institutional and inter-disciplinary organization that brings together faculty and graduate and undergraduate students from medicine, nursing, the humanities, and the social and basic sciences. She is course director for Upstate’s Health Care Ethics course for nursing and health professions students and teaches bioethics and disability ethics to medical students. She is also Co-Chair of the Dean’s Disability Inclusion Task Force. Dr. Garden helped to found and was a member (2015-2018) and president (2016-2017) of the executive committee of the Modern Language Association's Medical Humanities and Health Studies Forum. She helped to found, and is on the steering committee for, the Health Humanities Consortium. She serves on the editorial boards of the Journal of Medical Humanities, Literature and Medicine, the Journal of Clinical Ethics. From 2005 to 2011, she led the Literature, Arts, and Medicine Affinity Group for the American Society for Bioethics and Humanities. Dr. Garden may be reached at 315.464.8451 or at gardenr@upstate.edu. These links will take you to sites outside of the SUNY Upstate website. To return to SUNY Upstate, you will need to use your back button. Garden R. Critical Healing: Queering Diagnosis and Public Health through the Health Humanities. Journal of Medical Humanities. August 2019; published online ahead of print: https://doi.org/10.1007/s10912-018-9533-1. Jones T, Blackie M, Garden R, Wear D. The Almost Right Word: The Move From Medical to Health Humanities. Academic Medicine. July 2017; 92(7): 932-935. doi: 10.1097/ACM.0000000000001518. Caruso Brown, AE and R Garden. From Silence into Language: Questioning the Power of Physician Illness Narratives. American Medical Association: Journal of Ethics. May 2017, 19(5): 501-507 (special issue on mental health and oncology). Garden R. Who Speaks for Whom? : Health Humanities and the Ethics of Representation. Medical Humanities. 2015; 41:77-80. Editor’s Choice selection for online issue. Garden R. Ethics. In Keywords in Disability Studies. Ed. R. Adams, B. Reiss, D. Serlin. New York: New York University Press, 2015: 70-74. Garden R. Social Studies: The Humanities, Narrative, and the Social Context of the Patient-Professional Relationship. In The Health and Humanities Reader. Ed. Jones T, Wear D and Friedman L. New Brunswick: Rutgers University Press, 2014. Garden R. “Confined to Her Bed”: Illness, Disability, and Femininity in Susanna Rowson’s Charlotte Temple. Literature and Medicine. Spring 2013; 31(1): 40-62. Garden R. Distance Learning: Empathy and Culture in Junot Diaz’s “Wildwood.” Journal of Medical Humanities. September 2013; 34(4): 439-50. Wear D, Zarconi J, Garden R, T Jones. Reflection in/and Writing: Pedagogy and Practice in Medical Education. Academic Medicine. May 2012; 87(5):603-609. Garden R. Language, Identity, and Belonging: Deaf Cultural and Narrative Perspectives. Journal of Clinical Ethics. Summer 2010; 21(2):159-62. Garden R. Disability and Narrative: New Directions for the Medical Humanities. Medical Humanities. December 2010;36(2):70-74. Editor’s Choice selection for online issue. Garden R. Sympathy, Disability, and the Nurse: Female Power in Edith Wharton’s The Fruit of the Tree. Journal of Medical Humanities. September 2010;31(3):223-42. Garden R. Telling Stories about Illness and Disability: The Limits and Lessons of Narrative. Perspectives in Biology and Medicine. Winter 2010;53(1):121-135. Garden R. Expanding Clinical Empathy: An Activist Perspective. Journal of General Internal Medicine. January 2009;24(1):122-5. Garden R and Yoo Murphree, H. J. Class and Ethnicity in the Global Market for Organs: The Case of Korean Cinema. Journal of Medical Humanities. December 2007;28(4):213-29. Garden R. The Problem of Empathy: Medicine and the Humanities. New Literary History. Summer 2007;38(3):551-568. Last Modified: November 07, 2018. Contact Jessica Barbuto with questions about the content of this page.